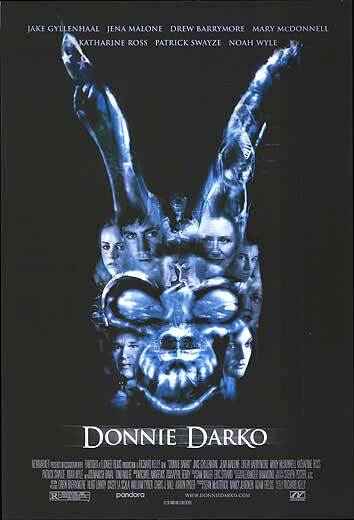 The other film about a six-foot-tall bunny. But unlike the comic James Stewart vehicle Harvey, writer/director Richard Kelly’s creation is entirely visible to the audience, extremely creepy and known as Frank. Brooding (and mentally ill) teenager Jake Gyllenhaal receives a sleepwalking vision that the world will come to an end in 28 days, 6 hours, 42 minutes and 12 seconds. Peopled with quirky characters brought brilliantly to life by a superb eclectic cast (that includes Mary McDonnell, Drew Barrymore, Katharine Ross, Noah Wylie, Jena Malone, James Duval, Patrick Swayze and Jake's big sister Maggie), Kelly offers biting and honest observations on suburban blight, self-help gurus, adolescent love, religious fanatics, artistic repression, with a twist of time travel and predestination thrown in for good measure. Difficult to categorize, DD initially suffered from a misguided marketing push and an unfortunate release date (a month after Sept. 11 might not have been the best time for a film that includes an imminent plane crash), but soon discovered a fervent following on DVD and overseas – a phenomenon explored in depth on the director’s cut 2-disc DVD.